By Shaun Walker in Moscow Thursday, 15 July 2010 Tobacco giant Philip Morris has been forced to admit that child workers as young as 10 have been subjected to long hours working on tobacco farms with which it has contracts in the Central Asian state of Kazakhstan. According to a report by Human Rights Watch, migrant workers at the farms, mostly from neighbouring Kyrgyzstan, were subjected to conditions that often amounted to forced labour, as employers contracted by tobacco farms that sold their produce to Philip Morris International had their passports confiscated and were often made to do additional work for no pay. The company, which sources tobacco from Kazakhstan for cigarette brands sold in Russia and other former Soviet states, said it was taking "immediate action" to stop the abuses. In many cases families were expected to pay back unrealistic debts to intermediaries who had arranged for their journeys to Kazakhstan, in schemes that bear all the hallmarks of people trafficking. The report also documented 72 cases of children working on the farms. Philip Morris produces brands such as Marlboro and Chesterfield in over 150 countries around the world, and purchased 1,500 tonnes of tobacco from Kazakh farms in 2009. The company issued a statement yesterday saying it is "grateful" to Human Rights Watch for raising the issues, and "is firmly opposed to child labour and all other labour abuses". The company says it is implementing a range of measures to ensure the abuses end, such as working with local government and NGOs to ensure school access for children of migrant workers, and implementing a system of third party monitoring to ensure tobacco farms comply with strict guidelines. Jane Buchanan, the report's author, blamed the Kazakh government as well as Philip Morris for the abuses. She said yesterday that progress had been slow with the authorities in discussions over bureaucratic hurdles and the need to provide schooling for migrant workers' children. "The commitments from [the government] have been very vague," she said. "It has been a lot of work to get them to accept the idea that migrant workers, even if they are working illegally, still have fundamental rights." According to Ms Buchanan, Human Rights Watch had first approached the tobacco conglomerate with the allegations in October last year, and there has been a "regular and constructive dialogue" since. "However, we have done some more research recently, and it's clear that not all the things they promised have been fully implemented yet," she said. One woman told the report's authors that young children had developed red rashes on their necks and stomachs after working with the tobacco, and there were also cases of dangerous pesticides being stored in living areas. During a single work day, tobacco harvesters can be exposed to a similar amount of nicotine as would be found in 36 average-strength cigarettes, and workers are at risk of contracting Green Tobacco Sickness, where nicotine is absorbed through the skin from contact with tobacco leaves. The illness causes nausea, vomiting, headache, muscle weakness and dizziness, and children are particularly susceptible due to their small body size. Migrant workers come to Kazakhstan from impoverished neighbouring countries such as Kyrgyzstan and Uzbekistan where there are few job possibilities. They are allowed to enter for up to 90 days without a visa, and the complications in securing official work permits mean that many end up working illegally, and are thus at their employers' mercy. In one of many such stories, Almira, 45, travelled to Kazakhstan from Kyrgyzstan with her husband and two children last year. They were promised by the intermediary who drove them to a tobacco farm in rural Malybai that they would be paid a minimum of $2,300 (£1,500) for their work over the season. However, when they arrived they were told they would have to work off debts from the journey, and had their passports confiscated by the landowner. "He treated us really badly," recalls Almira. "We couldn't defend ourselves, since we were on his land after all. We worked for 11 to 13 hours a day. The work was really hard." The family contemplated running away, but this was impossible. "Our passports were with the landowner, and we had no money. If we left, then all of our work would be for nothing. And without money, how would we even get back home from there?" 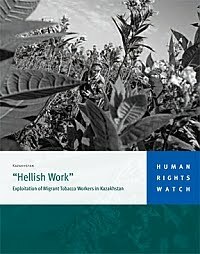 According to a recent report by Human Rights Watch, Hellish Work, Philip Morris has benefited from child and forced labor through contracts it holds with tobacco farms in Kazakhstan. Migrant workers from neighboring countries, come to work in Kazakhstan’s tobacco fields and occasionally bring their families. In total, Human Rights Watch found 72 children working in the fields, some of whom were as young as 10. Additionally, there were incidences of passport confiscation and workers not being paid. Workers face unsafe conditions such as exposure to pesticides, and levels of nicotine equaling around 36 regular cigarettes in one day. Workers are also at risk for contracting Green Tobacco Sickness, which causes symptoms such as dizziness, nausea, vomiting and headaches; children are particularly vulnerable. Some workers owed large debts to recruiters who arranged their travel and therefore felt unable to leave. Philip Morris promised immediate action, and committed to working with NGOs and local governments to ensure the children of migrant workers are in school. They also pledged to develop third party monitoring systems to ensure that strict policies are followed in the fields. Human Rights Watch is skeptical since they provided information from their research to the company last fall and recent research shows that conditions still have not improved. Since the story broke, the United States Congressional Committee on Energy and Commerce has asked Philip Morris to hand over any information it has about allegations of child or forced labor in the production of the tobacco it uses, as well as any allegations of document confiscation or unsafe living conditions. The committee also requested information on what the company has done to address these issues. It is unclear whether Philip Morris will respond to these requests, but the committee has asked them to provide the information towards the beginning of next month. If I win, $10K will go to Not For Sale, and $10K to International Justice Mission - ALL $20,000 WILL BE DONATED TO HELP RESCUE VICTIMS OF CHILD TRAFFICKING! E-cigarettes have less nicotine compared to tobacco. The nicotine in tobacco has strong poison and is the most addictive of all drugs. It may be helpful for these children, but it's still against the law to let them work. Tobacco companies should do something about that issue because it won't be good for them in the future.